The 'Surecrop' Strawberry Plant is a dependable, high-yielding, mid-season variety producing exceptionally large, lipstick red, firm fruit, even for novice and coastal gardeners. This June-bearing variety is ideal for canning and freezes well. Surecrop is a dependable grower, even if you are a beginner. It will perform best in light, well-drained soil and raised beds with consistent moisture. Surecrop is resistant to Red Stele, Verticillium Wilt, Leaf spot, Leaf scorch and Powdery Mildew. 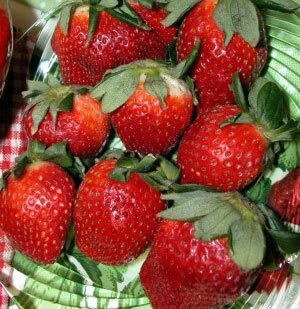 All our 'Surecrop' Strawberry Plants are organically grown and shipped in fine quality growing medium. They are guaranteed to arrive alive and ready to plant. Comment: A bit too soon to review. They have not arrived yet due to it being a little early in the season to ship. But I am looking forward to planting these Surecrop berries. Comment: Got these Surecrop Strawberries in and soaked them in water over night. Set them out the next day and they are blooming like crazy and keeping me busy. Comment: Our Surecrop plants arrived at the perfect time for planting in our Ohio garden and came with thorough instructions for planting. They are thriving so far. Very healthy!